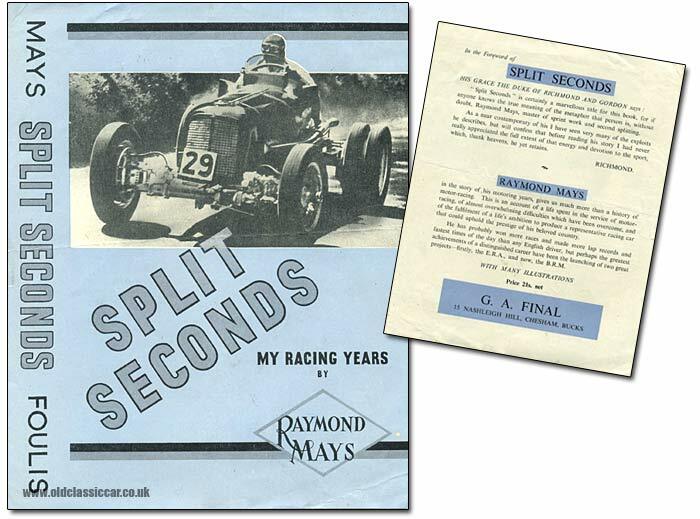 Raymond Mays book - Split Seconds My Racing Years. Homepage. This page: A flyer from the early 1950's promoting a new book about Raymond Mays. Split Seconds - a book about racing driver Raymond Mays. This flyer, printed in 1951, promoted the launch of a new book about driver Raymond Mays, the full title being Split Seconds - My Racing Years, an autobiography documenting his time behind the wheel of various racing cars, as well as being a key figure in the ERA & BRM car firms. Shown on the cover of the book, and on this flyer, is Mays competing in a speed hillclimb event behind the wheel of ERA R4D, perhaps the best-known of all the ERAs that were produced by the firm in Bourne, Lincolnshire, and a car still in active use today. Note the twin rear wheels, a common modification to aid traction at post-war hillclimbs. Foulis published a number of excellent motor racing books after the war, and Split Seconds is on my shopping list. Others, that I do own, include Speed Camera, Bits and Pieces, and Wheels at Speed. Raymond Mays in the story of his motoring years, gives us much more than a history of motor-racing. This is an account of a life spent in the service of motor-racing, of almost overwhelming difficulties which have been overcome, and of the fulfilment of a life's ambition to produce a representative racing car that could uphold the prestige of his beloved country. He has probably won more races and made more lap records and fastest times of the day than any English driver, but perhaps the greatest achievements of a distinguished career have been the launching of two great projects - firstly, the E.R.A., and now, the B.R.M. As already mentioned, the cover shows Mays driving his black ERA, R4D, at a hillclimb meeting. This car started out in life as R4B in 1935, and was primarily used in sprints and hillclimbs. Updates to the car in 1937 saw it referred to as R4B/C, and in 1938, after the fitment of a new lightweight chassis, it became R4D. In 1939 Mays purchased the car from the works and ran it as an independent, winning the Hillclimb Championship in 1947 and 1948. By the 1950's, Mays was concentrating on the V16 BRM, leaving him with less time for competition appearances. Despite this, R4D was still very active, in the hands of drivers such as Ken Wharton and Reg Parnell. 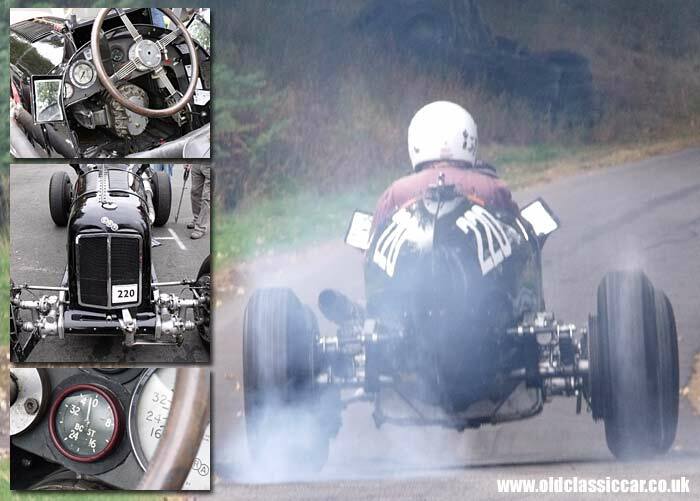 The photo below, taken at a recent VSCC meeting at Loton Park, shows ERA R4D with its new owner, Mac Hulbert, doing what ERAs do best. References to R4D appear in a number of locations on this site - for example, a collection of racing car artwork that was about to be thrown in a skip features ERA R4D, along with other examples of the ERA marque. References to Raymond Mays can also be found here and there on the site, for instance on the collectable race programmes page. One little-known fact is that Mays was President of the Lancashire and Cheshire Car Club in the post-war years. More race-related articles can be found in the motor racing collectables section. Included is a similar flyer to this relating to a book on racing a Healey Silverstone: Racing A Sports Car (Foulis, 1951), and another on the subject of Formula 3.